My previous post on Fannie/Freddie had two major parts. In the first part, I questioned whether the thirty-year fixed-rate mortgage would really go away (or become much more expensive) without Fannie/Freddie, as some people have argued. In the second part, I said, who cares? The first part has gotten a fair amount of good criticism, for example from Arnold Kling and John Hempton (by email), and also in comments. My position, simplified, was that a thirty-year fixed-rate mortgage includes three kinds of risk: credit risk, interest rate risk, and prepayment risk. Credit risk can be diversified, interest rate risk can be hedged, and Fannie/Freddie didn’t do anything about prepayment risk anyway. This is the kind of theoretical argument people make all the time, and the obvious question is whether the world actually works that way. I think there are two important criticisms. One, which Kling makes, is that while there are thirty-year fixed-rate bonds (like Treasuries) floating around out there, there just aren’t that many compared to the volume of U.S. thirty-year fixed-rate mortgages. So there might not be enough buyers, and without enough buyers the yields could go way up. One response is that the interest rate risk can be hedged, but that means you have to find a lot of people willing to take the other side of the interest rate swaps, and maybe that would be too hard. So the real question is how much demand there is for thirty-year fixed-rate assets. The second criticism, which Kling and Hempton make, is that the big issue isn’t the thirty-year maturity; the big issue is prepayment risk. A thirty-year fixed-rate mortgage gives the borrower the right to refinance and pay off the loan at any time, which means that even if you want a thirty-year asset, you can’t count on it. When interest rates go down, you’re likely to get your principal back, and then you’ll have to reinvest it at lower rates. Now, the classical response is that this is just an embedded option (for the borrower), and you should be able to price the option into the mortgage. So the real question is how many people are willing to write those options, and maybe the markets just aren’t deep enough. I’m not completely convinced by this, though, because Fannie/Freddie didn’t actually hold onto most of their mortgages. Instead, they created pools that issued mortgage-backed securities, and those things had both interest rate risk and prepayment risk (see pages 11-16 of this prospectus for a long list of prepayment risk factors). So people buying the MBS issued by Fannie/Freddie ($5 trillion of them), it seems to me, were happily taking on both interest rate risk and prepayment risk. This seems obvious to me, so I’m almost certainly missing something. For this reason, I’m still not entirely convinced that the private sector couldn’t take this on. Sure, interest rates would have to be higher because the private sector wouldn’t have the Fannie/Freddie implicit government guarantee* (although, as one commenter pointed out, part of the private sector has something like it). And with higher interest rates, thirty-year fixed-rate mortgages might become less popular compared to adjustable-rate mortgages. But that’s not the end of the world. Relatedly, John Hempton has another proposal for Fannie/Freddie: simply raise the fee they charge for guaranteeing credit risk. At some point the private sector will step in and take on the job, and in the meantime the government will lose less money and distort the economy less. * Without the implicit guarantee, the credit risk would be properly priced into the MBS issued by Fannie/Freddie, because Fannie/Freddie already charge a fee for guaranteeing the MBS. This entry was posted in Commentary and tagged Fannie Mae, Freddie Mac, housing, mortgages. Bookmark the permalink. Properly pricing credit risk is just not something we do around here anymore. Other than that, these are good ideas. Funny how nobody in government or finance is interested in stable hybrid public/private solutions that would work in the long term. If it doesn’t produce windfall profits for the Wall Street / Ivy League Axis of Oligarchs, with all the costs shifted to the former middle class, it isn’t on the table. You still have it wrong. Freddie and Fannie did not sell most of their MBS. Instead, they retained most of them in portfolios. They managed interest-rate and prepayment risk by issuing layers of callable debt and doing trades in derivatives. The ability to issue callable debt at low interest rates was dependent on the government guarantee. Without that guarantee, they would have had to pay higher rates and/or hold more capital, and that cost would in turn be passed through to higher rates on 30-year fixed. Did investors really view MBS as a 30-year security with prepayment risk? Or would they be much more likely to view such a security as a 7-10 year investment? It seems to me that since mortgages have historically been priced as a spread to the 10 year Treasury, they are actually viewed as shorter term. Hempton’s proposal is right. The best part is that if Fannie raises prices by, say, 50 basis points, even if that doesn’t encourage private entrants – it does two things – it helps more rapidly recapitalize the GSE’s (and avoids the Treasury and Taxpayers picking up all their gigantic mortgage-default losses), and it more adequately prices the real risk inherent in the lending – any move closer to what the market price would be is a better bet for everyone in the long run. I’m not saying that rates wouldn’t be higher on 30-year fixed. I’m questioning whether they would be “3 points higher,” as Bill Gross allegedly said, or whether they would be so high that the 30-year fixed would essentially become extinct. As the second half of my original post says, I’d be perfectly fine with rates on 30-year fixed going up. Also, if Fannie/Freddie didn’t sell the MBS, why weren’t they on their balance sheets (in the Flow of Funds) before 2009? Was that essentially accounting fraud that was allowed by the FHFA? I may have this wrong, since I’m relying on memory, but as I remember it, until relatively recently (late ’70s, early ’80s) prepayment penalties were common on fixed rate mortgages. They didn’t apply in the case of a bona fide sale, but they prevented opportunistic refinance. They went away as a result of legislation: wicked banks holding poor householders to mortgages with crushingly high interest rates. So prepayment risk has only really been around for about a generation. Maybe you should do your research and come back with a post when you have something definite to say? Please get the message that the RE market as it was known is now dead! Move up buyers are rare and hard to find. FHA drives the market based on 3/12 per cent down which creates immediate negative equity homeowner and keeps on giving. Orange county now back to 2003 pricing levels, Santa Monica and San Francisco experiencing higher foreclosed rates with greater number of NOD’s. Major American RE markets are dead filled with Short Sales and auction flips that create HomeDepot remodels overnight and try desperately to sell before the market declines and wipes out any chance for margin, and many are stranded. The FBI recently started investigating auction buyers for price fixing! Within this environment folks actually discuss topics like 30 year mortgage or what role will Fannie play! Sheesh the smoke and mirrors back in D.C. are thick and heavy! 1. a properly diversified (as to credit- and demographic prepayment risk) hypothetical pass through portfolio of F&F conforming mortgages tend to have a far shorter duration than 30 y treasuries (because of well known factors driving housing sales and household changes : “demographics”) No one considers them as long as treasuries. 2. “economic” prepayment risk (mainly caused by refinancing at a lower rate and defaults) should be historically low, given the level of interest rates. However, if the market would price all the risks involved in even a well-diversified portfolio of mortgages without a credible third party guarantee, it would probably look at market prices for private mbs. That market may be functioning poorly (maybe, maybe it was functioning poorly in 2004/5!) but it should reflect the fact that mortgages in the US (due to the limited recourse to the owner of the residence) are essentially long call options on assets that are perceived as quite volatile, much closer to the money than they used to be and for a very long period. That is a different paradigm than one where house price volatility used to be virtually ignored by investors who tended to look to the rating agencies. How the rating agencies did it is not well known outside their walls but the results look pretty suspicious. (A) improve the institutional characteristics of its intervention in housing finance, by minimizing transaction costs, maximizing operating efficiency and apply finance to develop a sustainable underwriting stance. The former are quite simple, but politically hard and involve important intervention in the informal property rights of politically relevant groups (the various agencies that operate outside the Fed/Treasury nexus, especially the FHA and the VA and have mixed objectives) and intervention in the property rights of F&F shareholders. Ideally there should be a single gvt agent for (a) guaranteeing housing debt (and the authority that defines its risk appetite) and (b) regulating the administration of mortgages under that gvt guarantee (structuring, servicing, providing “attachment points” for securitizers. Bits an pieces of that are in place, but is is, like many public sector ventures in the US, a mess, or rather, a rainforest. Of course this is barely a schetch, but it should be clear that such an approach would in many ways shape what can and can not be done in the provision of housing under the credit umbrella of the state. And of course, the state’s liability should be unambiguous and the home owner should pay explicitly for the credit insurance that makes his loan feasible and affordable. The main problem with such an approach is that it would be impossible for the state to price its guarantor service rationally (ignoring politics again, a much greater challenge to rationality), since such a large part of the market would be dominated by its presence that especially the signals for pricing the credit options embedded in the product would be suppressed by its own behaviour (analogous to the pricing problem of national healthcare) and the best option would be to adopt variable premia based on actual loss experience in preceding periods. That could be done with smoothing, but not using the long term fixed risk premium the market is used to and now embeds in its fixed rate products. The alternative (B) could be a simple Austrian solution: let the stae withdraw from this market while it can do cheaply. However that would ignore that fact that the State has a greater financial stake in the housing market than ever before, and that that stake is, eufemistically, quite fragile financially. There is another way for a State that is already up to its ears in debt: guarantee the value of homes AND index those values to construction costs plus an annual increase in the value of land developed prior to 2008, all of that during a period of 10 years, covering a complete ownership cycle of the entire existing housing stock . In that case no recapitalization would be required, house prices would stabilize, development would stop and the old stock would be absorbed. Meanwhile the gvt could figure out what to do next. Find me a politician who would vote against that.. The 30-year fixed rate argument is partly true. Regardless, we need some government backstop during financial crises because during times of great stress and uncertainty, private credit risk takers exit the mortgage market. For example, there were no private label mortgage securities issued in 2009 (one in 2010). Bank lending of non-Fannie/Freddie/Ginnie eligible lending was almost non-existent. Had there been no mortgage financing of home sales, then all transactions would have to be at the cash price. Since few homebuyers have that much in savings, house prices would have to fall dramatically to clear – including to clear the many foreclosure sales. Prices would have continued to plummet, and assured potential lenders to stay out of the market. Although bubbles can exist in any asset market, houses are much more dangerous to the general economy than other assets because they are the largest and most widely held, and because they are mostly purchased with debt. We learned in the Great Depression that bank deposits and home mortgages are subject to panics that will create a chain reaction through the economy; therefore the government gave those two assets special treatment by providing catastrophic risk coverage. Regarding duration, a 30-year mortgage term is very risky to someone. If the interest rate is variable, then the risk is to the borrower. If the rate is fixed, then the lender/investor takes the risk. That risk is greatly amplified if the lender purchased the mortgage with leverage. The extreme liquidity of Fannie & Freddie’s MBS, along with the government implied guarantee enabled many more MBS purchases by cash rather than leverage buyers, such as sovereign funds, pension funds, etc. These cash buyers greatly increase the demand for 30-year fixed’s. Given that 90% of ‘AAA’ rated prime and Alt-A private label issues between 2005-2007 have defaulted (or are now <='CCC'), I very much doubt that you can convince those investors that any security is really safe unless it is backed by a strong government. I don't care who makes new underwriting and rating rules, the trauma is too great for the next decade. If we do have 30-year fixed rate mortgages that are purchased with leverage (including banks funding with demand deposits), then I think we will someday see another financial crisis that will overshadow the recent one. We have too much confidence that interest rate swaps truly net risk out rather than moving it to other parties, and in particular concentrating it in a few parties. Or put simply, another collapse in the making. How bout the sleeper cells nappin in the weeds? This “private” secondary mortgage market of ours is not ready to take over the mortgage business of the GSEs. We have had a government-sponsored market since the 1930s. Today most “investors” in this market do not understand these securities in terms of credit or market risk. Without a credible guarantee from Uncle, these “commodity” agency securities go back to being specified pools of loans, each of which must be priced as to volatility and implied duration. How many people in the room can do this? Keep in mind that most Americans cannot price a mortgage. Nor can most banks calculate and manage the implied Option Adjusted Duration of a mortgage book and the attendant servicing portfolio. So be careful what you wish for James. perhaps. There are so many dimensions that it is hard to make rules of thumb. The “uncle” you are refering to has a nasty habit of “bait and switch”ing on many issues, mostly with the insurance trade. One that insurance companys should start to feel the squeeze just from mother nature alone. And they make it their job to see that “investers” do not understand these securities in terms of credit or market risk. So where is the problem of simplification of these securities, and/or Congressmens ability to do their own taxes for that matter. I mean who really needs a lawmaker that has others do his taxes, put the others in as lawmakers or simplify the tax/secutities codes so that investers/congressmen do understand how to do their own taxes/simplified securities. Mortgage markets with strict prepayment fees are quite rare around the world. Most countries transfer much more risk to the borrower, hence (a) the absence of strict (penalties upon prepayment) very long fixed interest periods (b) the prevalence of floating rate and medium term fixed (but repayments may be spread over fifty years) interest reset periods. Those markets are much easier to hedge and fund of course and that means that spreads to the relevant risk free rate tend to be quite low, relative to corporate credit etc. The crazy system of prepayable long term mortgages that no one can model with any degree of plausibility is unique to the US, I believe. You are very correct in that matter, perhaps that is why we have a black president from Chicago with a taxi cab in his back pocket. The days of models and tranches could be the here now. Once again your correct, and it was the lifting of the usury tax law that lead to high interest rates in the name of inflation. Only meant to be in effect for @10 years, or extremely strange things would begin to occur from the greed inspired/easy money ones. Those are now coming to a head in all sorts of fashons and disquised in at least as many ways to confuse and angry those whom believed the few took advantage of the masses. Quite low of them indeeed. 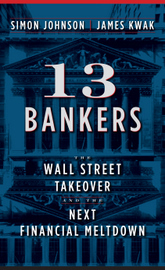 Analogist, the entire book 13 bankers was based on shoddy work and conspiracy theory. This garbled note from Kwak only brings forth the thinking. Johnson hides behind his tenureship and Kwak hides in school forever. “limit or ban pension funds (particularly the public ones) from investing in hedge funds and other ‘alternative’ investment vehicles. These pension funds have been the Dr. Frankenstein of the crisis by funding speculators of all breeds. These should be straved of public pension fund money, which would bring their size and ability for havoc to a modest level. Pension funds are intended to provide security for savers and the elderly. Yet pension funds fueled the housing bubble and were abused (some would argue defrauded) by financial innovation (synthetic CDO’s, the Abacus deal, the Magnetar trade) in the financial debacle of 2008. Professor Allaire’s comment makes a great deal of sense. The mechanics that keep the Rube Goldberg device sputtering along should really find work with value to society. Nationalize housing, move to a planned economy, put intelligent, vetted people in charge,and watch them very very carefully, create a mechanism that prevents the accretion of power through favor and nepotism. You’ll still be able to express your desire for dominance, but you’ll do it in a way that benefits your race, not shames it. This “private” secondary mortgage market of ours is not ready to take over the mortgage business of the GSEs. We have had a government-sponsored market since the 1930s. America’s future. This will only continue the reckless over building of the last 20 years,generate higher Federal debt for the sole purpose of enriching supporters of the political inner circle. If home ownership is such a great deal or a wonderful investment then getting private capital to fund the financing necessary should not be a problem. Isn’t this the real root of the problem? Levering up to buy an asset that exceeds your total net worth at the time of purchase, and that you plan to pay for out of your future income, has always been risky. In the 50s and 60s the (unionized) working and middle classes were well-off enough, income-wise, to get away with this and make it the new normal; but now that the bottom has dropped out of most people’s incomes while housing prices skyrocketed, there’s no way to paper over the cracks anymore. Furthermore, workers used to have enough job and pension security that they could actually rely on their future income stream; now they don’t and income volatility sends them into default. “something definite to say” – analogist, do you have anything “definite” to say? How can we talk about government OR finance? They’re the same thing. And there is no such thing as a “public” solution anymore. I’m just agreeing with you, albrt. In your first post on the GSEs, you called for standards so that investors did not have to look at every single mortgage. The logic behind this statement is fundamentally flawed. Just because there are standards does not mean an investor should not look at every single mortgage. The inability to look at every single mortgage and see how it is currently performing is THE primary reason that the private mortgage market blew up. If you cannot see what you are buying or own, how can you value it? @HW: I understand that we have a black president from Chicago (which would be SO much cooler were he a better president) but I have to confess that the taxi cab reference went right over my head. but I have to confess that the taxi cab reference went right over my head. It’s more than just inlaws baby. “If you cannot see what you are buying or own, how can you value it?” Well, EXACTLY. The same problem exists for the borrower, but no one seems to talk about this. For heavens’ sake, if you borrow to buy a home using a variable rate mortgage, how will you ever be able to calculate what you will wind up paying for it? You won’t! You have no idea. The whole driving purpose of bankers and “investors” is to make money at others’ expense, and to make sure that the great majority of people remain wage-slaves to the wealthy. Who’s kidding whom, here? Hard to argue with the intention. But how to implement and police?? William Black comes to mind. He would have the technical knowledge to answer your question on enforcement. I think you have tippyed one too many. Very true. The moment that you have this crazy hybrid system of long-dated mortgages with free repayment options (OK not free, but cheap), then you have to ask yourself one of two questions (preferably both). a) where can I hedge this risk or b) who wants to buy a long dated asset that might disappear at any point. The answer to a) is nowhere, even close to effectively, at the margins that FNM and FRE price this business at. The answer to b) is noone in their right mind at these spreads. Fixed rates 3% higher? I can see that. In the UK the most aggressive 2yr rates are about 3% with around 1% in fees. 2yr swap rates are 1.90%. And that’s just for a 2 year assuming zero maturity transformation and no free prepayment option, on a maximum LTV of 60%. On a 30yr with an LTV at 90%? 3% sounds like child’s play. James what you are failing to understand here is quite what a horrible, extremely exotic product the basic common-garden 30yr fixed rate US mortgage is. It’s a collateralised loan with virtually no upside (if the property appreciates or interest rates fall dramatically it will be terminated) and a load of downside – if property depreciates or interest rates rise it might well last 30 years, with insufficient collateral backing it. It’s assymetrical. Stop being lazy, try pricing the real embedded options here. Since when were hedge funds responsible for any of the last 3 years? And what the heck has your post even got to do with the topic at hand? No, perhaps you are failing at reconizing the laws of nature at hand. We soon shall be forced into a broader global economy that demands more of our garden varity investments. New laws shall make that task easier but take a bit of time to implement due to large amount of resistance from business and political interests. That though will slowly fade away, and we are currently witnessing that take place as the interests flee to safer but colder and fewer havens. There is nothing lazy about, the price is the price and NOTHING more. How this country has “changed” is utterly unacceptable. Look into the history of how WWII troops were organized and had – wha’? – “socialized” housing support…?